It seems there are more messaging apps than we can handle although some like WhatsApp and Skype have become household names, almost everyone uses or at least knows about them. While WhatsApp and Skype or even Facebook Messenger might command a huge market share, there are some like Kik that are beginning to make their mark. If you are wondering what Kik is, then read on to find out. What Is Kik and What Makes It Different? Kik is a free messaging app that has a user base of about 50 million worldwide. 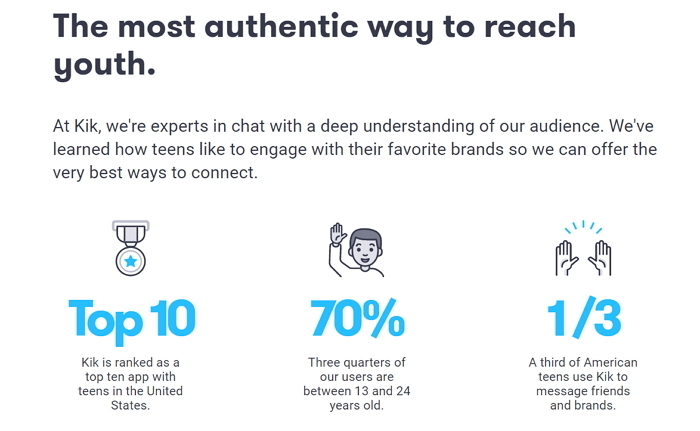 This may not be as huge as WhatsApp, but Kik does command a base of core users, mostly young people between the ages of 13 and 24. While at its core, it is a messaging app, it differs from WhatsApp in a very crucial way. It doesn’t use the user’s phone number as the “username.” Instead, a user can simply make up a username that they can share with friends while chatting on Kik. Why Are Kids on It? In its core, it is a messaging app just like any other. But there is a reason young people (especially teenagers) can’t get enough of Kik. The app is specifically designed with this age group in mind. It comes with an inbuilt browser and a lot of other internal native apps. What this means is, once a user is on Kik, there is very little reason to leave the app. They can browse web pages on it, watch videos, play games and even listen to music, all while chatting. Kik has a lot of in-built features that make it the ideal solution for those looking for an efficient messaging app. Here are just some of them. You can see when the person you’re chatting with is typing. This is especially great to let you know to expect a message in a few seconds. When you send a message, you can also see if the message has been received even if the other user hasn’t replied yet. You get notifications when your messages have been sent and delivered. You can even customize the notification sound. You can send invites out to your friends in numerous ways; via SMS, email or through other social networks like Facebook and Twitter. If one of your contacts is on Kik, the app will recognize this and sends both of you a notification to connect on Kik. Every Kik user has a Kik code which can be accessed from the app’s settings. You can use this Kik code to add users. Simply tap on the search icon > Find People > Scan a Kik Code. The app will need access to your camera to scan the code. You can also send GIFs, videos, sketches, photos and emojis among others. A video chat feature much like FaceTime is also available. You can start your own group on Kik. Simply tap on the search icon and then “Start a Group” and begin adding people to the group chat. When you add people to a chat, you should also see the option, “Promoted Chats.” Taping on this option will open a list if interesting chats you can join in on. It is very important to worry about safety especially where messaging apps like Kik are involved. There are a few glaring issues that may make Kik dangerous to the average user. They include the following. Chats can be deleted and it offers no parental control features. Profiles are visible to anyone and as such very popular among sexual predators. since they can contact anyone they want at random. The anonymity can create a great environment for cyberbullying and harassment. Users are required to be above the age of 13 although the site lacks age verification. There are however certain steps Kik users can take to ensure their safety. They include the following. Don’t share personal information online, especially information that may make it easy to locate you offline. If you are uncomfortable with something online, talk to a grown up about it.